For eons, scientists and their monkey progenitors have thought that the stars in the sky were innumerable. Not so, friends. Sega has created a planetarium that shows just 10,000 of the most important ones, including a red hot shooting star function, for kicks. 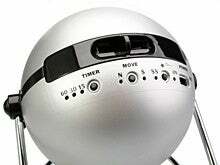 The HomeStar—yes, we know, Strong Bad—costs $229.99 and lets you project the universe on your ceiling and walls. This 2 pound ball can also simulate the starscape in the northern and southern hemispheres and includes a travel adapter for when you want to show off to that girl you picked up at the Fleisch Marke.